This example demonstrates a simple method for how you can get detailed camera information and capabilities of your camera in C#. To implement this example, you need to have OZEKI Camera SDK installed, and a reference to OzekiSDK.dll should be added to your Visual Studio project. How to get detailed camera information and capabilities using C#? 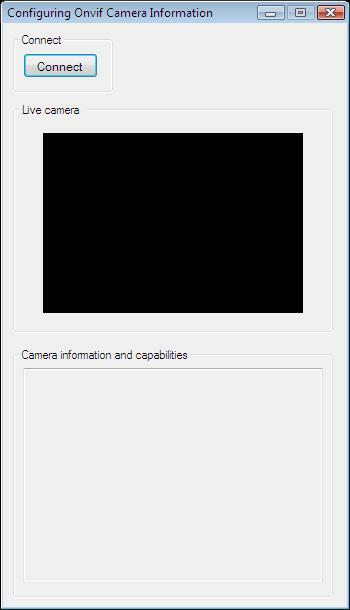 In the GetDeviceInfo() method you can get information and capabilities of your camera by getting the _camera object's properties. After the successful implementation of the functions and the GUI elements, the application will work properly. Pressing the connect button will load in the image of the IP camera device connected to your PC into the panel that you can see on the picture. After you have connected to an onvif camera successfully, you can see information and capabilities of your camera. Can I get more queryable information about the camera? of the camera like DHCP, DNS, HostName, HttpPort, HttpsPort, IpAdress, MacAddress etc. For more queryable properties please see under the IPCamera class definition.